56 • October 2014 • S I G N & D I G I T A L G R A P H I C S WRAPS DIGITAL GRAPHICS Vehicle Wrap Films Type: Cast or calendered Keys: Balance between cost, installa- tion and long-term durability (also the skills of the installer—calendered film is trickier to install on a curvy car but comes at a nice price point). Cast film offers better conformability and longer durability. Full Print: No horizontal warranties (hoods/rooftops), vertical warranties are between three and five years (laminated). Single Color Film: Horizontal war- ranties between one and two years; ver- tical warranties between three and 10 years; textured films (like brushed and carbon) do not come laminated. 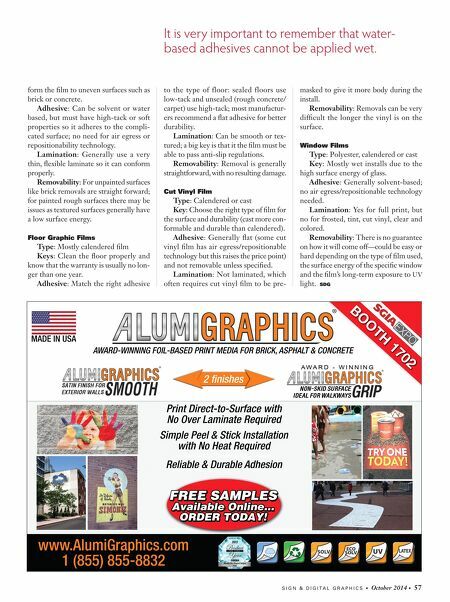 Adhesive: Can be water or solvent based, can employ flat or air egress/repo- sitionable adhesive technology. Lamination: Generally use a lam film between 1.3mm and 2.1mm thick; thin- ner lamination can help the film conform to compound curves and recessed areas better. Removability: Short- or long-term installs should remove easily, leaving no or very little adhesive residue. Vehicles must have OEM paint in good condition to get warranties from most manufac- turers. Wall Films Type: Calendered films are most often used based on cost, and because they are easier to install (thicker/more body) since the application surface is flat (no need for the higher conformability of cast). Keys: Wall preparation is a must. Low VOC or washable wall paints are causing major problems in terms of wall film's ability to stick to the paint, so double and triple check with the manufacturer on their wall-prep recommendations. Adhesive: Water or solvent based; can use air egress/repositionable tech- nology but this can raise the price point and, due to the low surface energy of walls, it isn't essential. 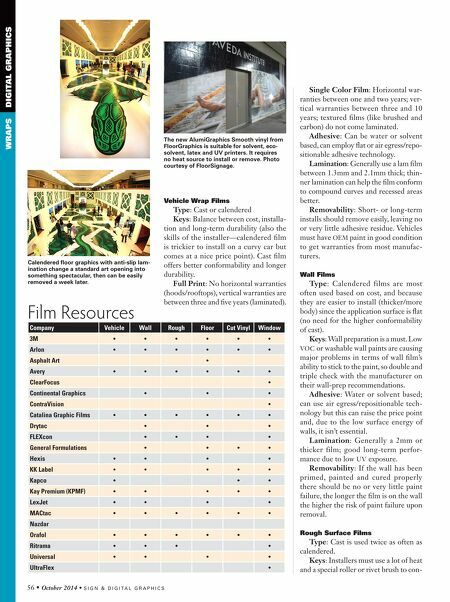 Lamination: Generally a 2mm or thicker film; good long-term perfor- mance due to low UV exposure. Removability: If the wall has been primed, painted and cured properly there should be no or very little paint failure, the longer the film is on the wall the higher the risk of paint failure upon removal. Rough Surface Films Type: Cast is used twice as often as calendered. Keys: Installers must use a lot of heat and a special roller or rivet brush to con- Film Resources Company Vehicle Wall Rough Floor Cut Vinyl Window 3M • • • • • • Arlon • • • • • • Asphalt Art • Avery • • • • • • ClearFocus • Continental Graphics • • • ContraVision • Catalina Graphic Films • • • • • • Drytac • • • FLEXcon • • • • General Formulations • • • • Hexis • • • • KK Label • • • • • Kapco • • • Kay Premium (KPMF) • • • • • LexJet • • • • MACtac • • • • • • Nazdar Orafol • • • • • • Ritrama • • • • Universal • • • • UltraFlex • The new AlumiGraphics Smooth vinyl from FloorGraphics is suitable for solvent, eco- solvent, latex and UV printers. It requires no heat source to install or remove. Photo courtesy of FloorSignage. Calendered floor graphics with anti-slip lam- ination change a standard art opening into something spectacular, then can be easily removed a week later.